Where to find Saint Irenee hotels near an airport? Where can I find hotels in Saint Irenee that are near tourist attractions? 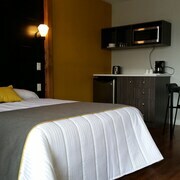 Keen to book a convenient hotel or apartment while you are in Saint Irenee? Around 14 hotels and apartments are located within a 0.1-kilometre (0.06-mile) radius of Saint Irenee's town center. Although Saint Irenee can't boast to having an extensive selection of accommodations close to the downtown area, Domaine Forget should be close enough to satisfy most visitors. 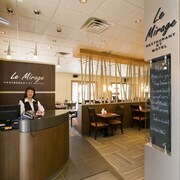 The Fairmont Le Manoir Richelieu is located 8 kilometres (5 miles) from downtown Saint Irenee. 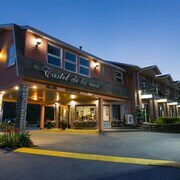 Alternatively, the Hotel Pavillons Le Petit Manoir du Casino can be found 8 kilometres (5 miles) away. The Auberge Fleurs de Lune and the Hôtel Au Petit Berger are some other Expedia-listed hotels around Saint Irenee. 75 kilometres (46 miles) to the northeast of Saint Irenee is Tadoussac, home to the Tadoussac Marina and Saguenay–St. Lawrence Marine Park. 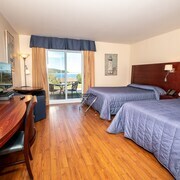 Some of our recommended Tadoussac accommodation options are the Hôtel Tadoussac and Motel le Vacancier. 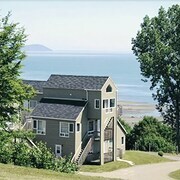 Or, you could consider staying in Saint-Joseph-de-la-Rive, 17 kilometres (10 miles) to the southwest of Saint Irenee, where you'll find the Auberge La Maison sous les Pins and Hotel La Roche Pleureuse. While in Saint-Joseph-de-la-Rive, set aside a little time to visit the St-Joseph-de-la-Rive Ferry Terminal and Charlevoix Maritime Museum. If you are into sports and really like local games you might decide to make a trip to Arena Luc et Marie-Claude, which is 25 kilometres (16 miles) to the southwest of Saint Irenee. 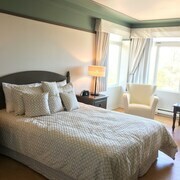 For those who are interested in booking a bed close by, make a reservation in the Auberge La Grande Maison or Hotel Baie-Saint-Paul. Visit our current Saint Irenee travel listings and discover the great cultural and scenic attractions that this area has to offer. What are the most popular Saint Irenee hotels? Are there hotels in other cities near Saint Irenee? 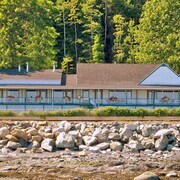 What other types of accommodations are available in Saint Irenee? Explore Saint Irenee with Expedia.ca’s Travel Guides to find the best flights, cars, holiday packages and more!